Don't make do with the Windows 10 Magnifier! 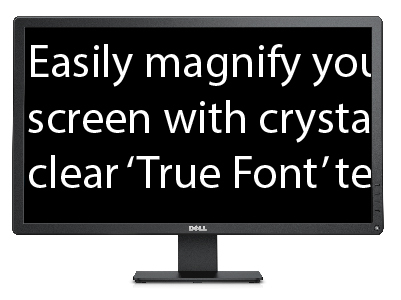 True Font magnification that’s always sharp and crystal clear. Magnification with more precision – magnify up to 64x or choose fractional, low level magnification ensuring text and images are always the perfect size. The optimal view of your magnified screen, with split screen options, hooked areas to keep fast-changing data in view or SuperNova’s unique line view – perfect for effortless reading. A huge selection of large high contrast mouse pointers that accurately track ALL the action. Intuitive touchscreen magnification with high contrast onscreen keyboard. A choice of 24+ colours schemes or create your own, even replacing difficult to see colours. Multiple applications perfectly magnified across multiple monitors, creating a clearer, more productive working environment. Connect a USB camera and view printed documents clearly. Your magnified documents and web pages reflowed in a dedicated DocReader window designed for reading in comfort. Available on USB – just plug SuperNova in and have every PC set up & ready the way you like it, with no installation or administrator required! High quality, natural sounding voices for reading long documents. Click and read with the mouse from any point in your document. Choose speech as you type to improve accuracy. Add a scanner or document camera and press CAPS + O to read your printed material independently. Perfectly synchronised text and speech – your document or web page will scroll to the right place as you listen. Mute voice instantly or toggle on and off as needed.